I know! I’ve been posting TOO MANY SWEET RECIPES lately. 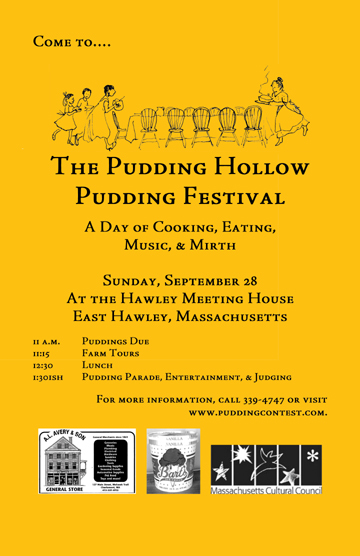 But I haven’t yet written about this year’s Pudding Hollow Pudding Festival. 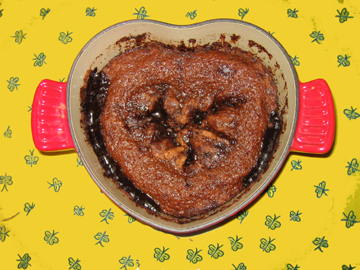 So here’s a brief report for pudding fans along with the winning recipe, a (gulp!) sweet pudding. Save it for Thanksgiving when the calories will be just a small part of the day. Our Day of Pudding was exhausting—and exhilarating—and just plain fun. Its spooky scheduling (Halloween!) 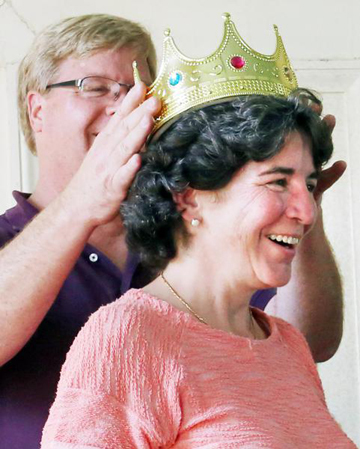 this year was an accident—the result of musical director Alice Parker’s busy schedule. We were a little worried that having the festival on this busy day would reduce attendance, but we had no choice so we decided to do it anyway. It turns out that Halloween is a GREAT day for puddings! Several contestants (and even members of the general public) came in costume. Everyone seemed to enjoy the new prizes for best costume, spookiest pudding, and best pumpkin pudding. Our wonderful judges—Edie Clark of Yankee magazine, Kathleen Wall of Plimoth Plantation, and Michaelangelo Wescott of the Gypsy Apple Bistro—had to work extra hard this year. In the past we have held a semi-final round a few weeks before the big day to cull our finalists down to a manageable 15. This year the Sons & Daughters of Hawley had a heavy schedule and couldn’t face adding the semi-finals to it. The judges therefore had all 27 entries to work on. I have a feeling their digestive systems are only now recovering from the experience! If we had cut off entries earlier, however, the panel wouldn’t have been able to taste the pudding that won this year. 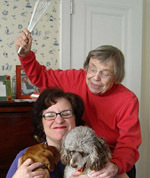 Paula Zindler of Cummington, Massachusetts, told me she only decided to enter the contest the week before Halloween. 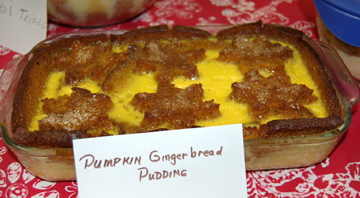 Her pumpkin gingerbread pudding delighted both the eyes and the taste buds. As always, our entertainment took a lighthearted look at the culinary history of my hometown of Hawley, Massachusetts. “The Witches of Pudding Hollow” stirred up a big pot of potion and a lot of fun for thespians and audience members alike. 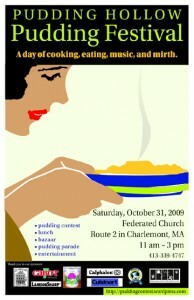 To read Edie Clark’s description of the judging process, please visit her blog. And if you’d like to see more photos of our big day, please go to the Pudding Festival web site. Meanwhile, here is Paula’s winning pudding recipe. 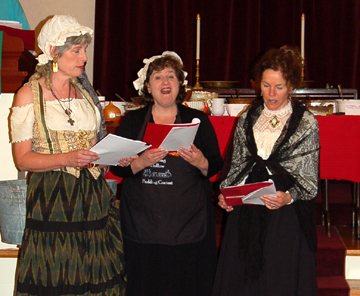 The Witches of Pudding Hollow (I'm the short witch in the middle) sing about their brew. Preheat the oven to 350 degrees. Butter a loaf pan well; then line the bottom with buttered waxed paper. Sift the dry ingredients together and set aside. Combine the wet ingredients in a large bowl and beat until well blended. Gradually add the flour mixture to the pumpkin mixture, stirring until smooth. Pour the batter into the prepared pan and bake for 1 hour 10 minutes. Allow to cool completely in the pan, covered with plastic wrap. Cut the loaf into quarter-inch slices and line a 10-inch buttered ovenproof dish with the slices. (The dish must have 2-inch sides.) Set aside. Combine the milk, cream, and sugar in a heavy saucepan over low heat, stirring until the sugar dissolves. Remove from heat and cool by stirring for 5 minutes. Combine the whole eggs, egg yolks, and vanilla in a large bowl and beat lightly until well blended. Quickly whisk 1/2 cup of the slightly cooled milk into the egg mixture and then slowly pour the egg mixture into the milk pot, whisking continuously over low heat. When the milk mixture just begins to put off steam, remove it from the heat and pour it into the baking dish. Allow the custard to soak into the bread for 10 minutes. 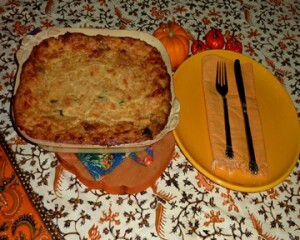 Place the baking dish into a pan of hot water in a 350 oven for 50 minutes or until the custard is set. Enjoy at any temperature. 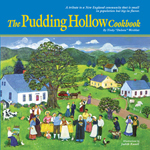 With LESS THAN TWO WEEKS to go before the Pudding Hollow Pudding Festival, I thought I’d post another pudding recipe. 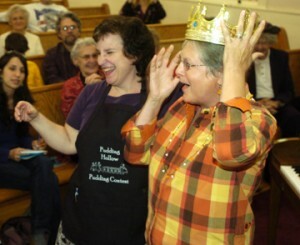 I hope it inspires readers to enter the festival’s gala pudding contest. 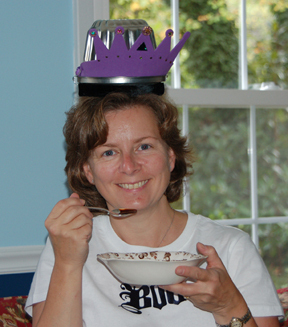 This year’s festival falls on October 31 so I’m offering a recipe from the Queen of Halloween in my hometown of Hawley, Massachusetts, town clerk Cyndie Stetson. 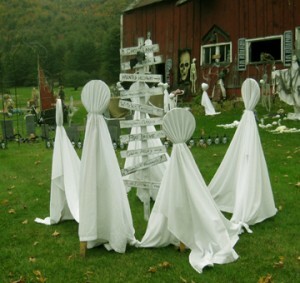 Each autumn the spooky display outside Cyndie’s home on West Hawley Road dazzles those of us who drive by. 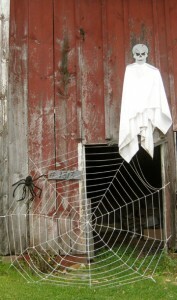 It offers a number of vignettes—a pumpkin crossing, a mad scientist’s lab, a witch’s lair, and a pirate ship—plus assorted spider webs, severed limbs, tombstones, and ghosts. Indoors, Cyndie celebrates with Halloween jewelry, lights, dolls, and crawling creatures, plus (my personal favorite) an orange cocktail shaker and matching martini glasses. Cyndie assures me she is entering this year’s contest. 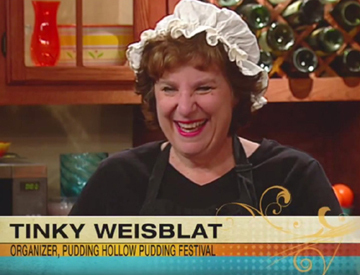 Two years ago her Autumn Comfort Pudding won the top award, and she has placed as a finalist several times. The hearty pudding recipe below made it to the finals a few years back. It’s perfect comfort food for our current chilly, drippy weather. I plan to adapt it soon. I’d like to substitute standard ingredients for the muffin mix. 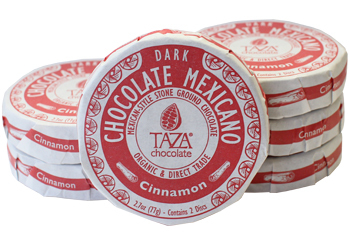 I’d also like to experiment with a Southwestern version and add a little chipotle and/or cumin. Meanwhile, below lies the easy version from the Queen of Halloween herself. 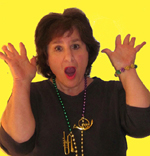 Before I give you the recipe, I want to let readers know about my new book giveaway. In keeping with the season, I am holding a drawing for a copy of The Perfect Pumpkin by Gail Damerow. The book offers a little history, a little advice on cultivation, and a number of tasty-looking recipes. Anyone who takes out an email subscription to this blog will be eligible for the drawing, which will take place at approximately midnight EDT next Monday, October 26. This includes current subscribers, of course (I hope you’ll spread the word to your friends)! If you’re not a subscriber and would like to sign up, please click on the link below. Good luck! And now, here’s Cyndie’s recipe……. Preheat the oven to 350 degrees. In a large bowl, blend all the ingredients well. Place them in a well greased 11-by-7 inch baking pan or round 2-quart casserole dish. 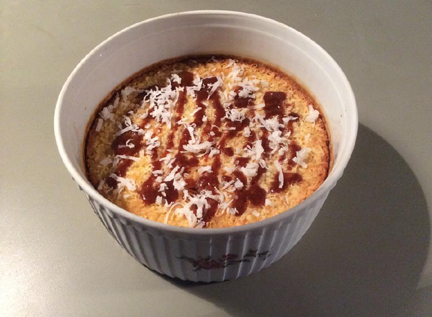 Bake the pudding until it is lightly browned on top and a toothpick inserted into the center comes out clean. This will take about an hour, but start checking after about 45 minutes. Serves 6 as a main dish or 8 to 10 as a side dish. 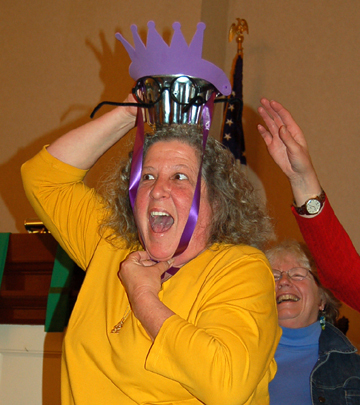 Cyndie (right) was surprised at her pudding-contest victory in 2007.